Organic food. People are either for or against it. Organic converts conscientiously object to the overcrowding of livestock, genetic modification, the use of antibiotics and other chemicals in conventional farming, whilst skeptics will insist that the organic food’s claim to superiority is purely anecdotal, even mythological. Whatever the case may be, there are some of us who want to eat organic. Unfortunately, ‘organic’ is often a byword for ‘expensive’. So how does one eat well without a) spending a fortune on groceries or b) going Gourmet Farmer? 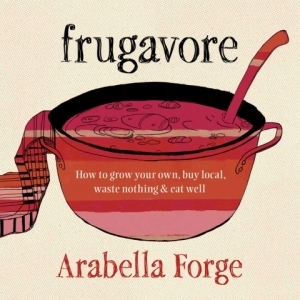 In Frugavore, nutritionist and slow-food advocate Arabella Forge shows how it can be done with a mix of recipes and practical advice. Chapters on vegetables, poultry, soups, beans/lentils/pulses, meat, seafood, grains, dairy, desserts, and preserves discuss various ingredients, comparing the nutritional value and health benefits of each. Marrying professional opinion with personal experience, Forge channels the authoritative tones of Shannon Lush of Spotless fame and Backyard Self-Sufficiency gardener Jackie French; her notes on fats, grains, and sugars have more in common with a home economics textbook than most cookbook glossaries. There’s also descriptions on how to make the most of one’s ingredients, including peasant-style recipes. In between recipes and ingredient monographs, Forge offers general advice on thrift. Some of it deviates from food: homemade cleaning products, composting methods, an argument for keeping chickens. However, much of the book is dedicated to sourcing good quality food. Sourcing suggestions are more idealistic than practical – farm gate produce tends to be out of reach for the average city-dweller. Still, those with limits on what they can grow at home, due to space restraints or otherwise, will find inspiration. Organic-food skeptics may fail to appreciate this revival in culinary thrift, however, since it’s being packaged in a manifesto-like guide to frugal, organic living. The words ‘nutrient density’, used by Forge in her introduction, will probably turn them rabid, if they haven’t done so already after realising that the book is published by the same mob who presented a flattering portrayal of Christine Milne. Their loss, I say. On the other hand, the converted and those who don’t give a hoot about organic food either way will appreciate this new bag of old tricks. I may well have to check this out when I’m next at the library. Her recipes didn’t appeal much to me (no photos) but I did find the rest of it a fascinating read. Don’t expect much on gardening and chickens though; it’s mostly about food. This sounds great. I enjoy reading your posts. Looking at my bank account is very depressing lately. Yeah, I’ll be doing a confession post on all of this month’s unnecessary purchases v. soon. Thanks for dropping by!